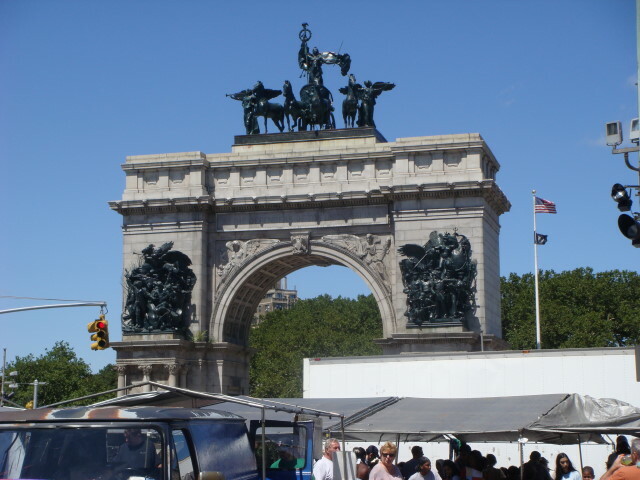 My latest posts have been about my wanderings out and about Brooklyn on Saturday, August 18th. Here’s another. What can I say? It was a busy day. I still have two or three posts left that cover the weekend. It may be for the best because this coming weekend’s weather may not be quite as accommodating as last weekend’s. In any event, I sure hope it doesn’t include another mugging. Anyway….this post isn’t about next weekend, but about my Park Slope (Brooklyn) wanderings. Where we left off, I had managed to aimlessly wander around the ENTIRE PARK!!!! What was I thinking? I’ll tell you what I was thinking: “I need to get to Grand Army Plaza and get something to eat.” Ahhh, sophisticated thought processes on display there, eh? (Truth: it’s a big park, but it is walkable.) When I finally did spot Grand Army Plaza, it was a moment of pleasant relief. Here’s a pic of the arch. It is part of Park Slope, but it seems more or less a place all to itself. I’ve been there before and each time, there’s been a Famers Market. You can see part of it at the bottom of the picture of the arch. NYC is big on farmers markets. I was pretty tuckered out when I got to this point. 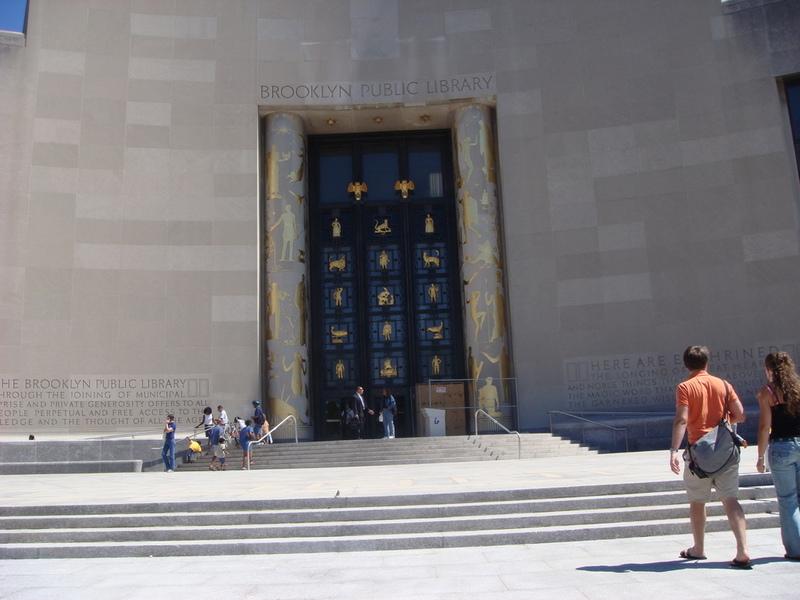 I did notice the Brooklyn Public Library just to the side and just had to go in. Oh, there doesn’t really seem to be any places there that I wanted to eat; so I went a few blocks back to 7th Avenue and found the Tex-Mex place I mentioned in the Park Slope post. It wasn’t worth walking the few extra blocks. Well, I’ve gone further for worse, so no real complaint. This entry was posted on August 21, 2007 at 7:05 pm and is filed under Brooklyn, Wanderings. You can subscribe via RSS 2.0 feed to this post's comments. You can comment below, or link to this permanent URL from your own site.